During my training break, I got kind of hooked on run commuting. I found it to be a fun way to get in miles and really enjoyed it. I’ve had a number of people ask me questions about how I made it work so I thought I’d share a few tips on run commuting. If you run commute and have some tips, please share in the comments! Plan ahead. This is the solution for everything, right? I prefer to run commute home after work because I find that a bit easier on the planning front. But running to work can be just as easy with planning. If I’m going to run commute to work, I make sure that I have my work clothes ready to go in the office and that I’ve brought my lunch for the day earlier in the week. If I’m running home, I choose a day where I won’t need to bring my work laptop home with me (which means I don’t usually run home on Fridays). How to carry your stuff. This is probably the most common question I get about running commuting. Here is what I do: I wear my camelbak pack without the bladder. I can fit my wallet, keys, phone, flats (to wear to work the next day) and a couple other items (papers, etc.) in the pack and it doesn’t feel weighed down. I leave everything else that is not a necessity at the office and take it home the following day. I was nervous when I decided I’d run commute about the aspect of carrying my stuff but I find this works great. It also lets me feel like I’m actually getting my money’s worth out of my camelbak since I very rarely run with it anymore with the bladder. How to work run commuting into your training schedule. I use run commute runs as easy runs on my schedule. They are by design shorter runs (I only live a couple miles from my office, but I can extend the route to get what I need) and they are slower runs as well. I’m never going to set any speed records run commuting but it is a fun way to break up everyday easy runs and also a nicer way to commute. I pretty much always beat my bus home when I’m running and it’s much more pleasant than sitting in traffic. Also it’s free! 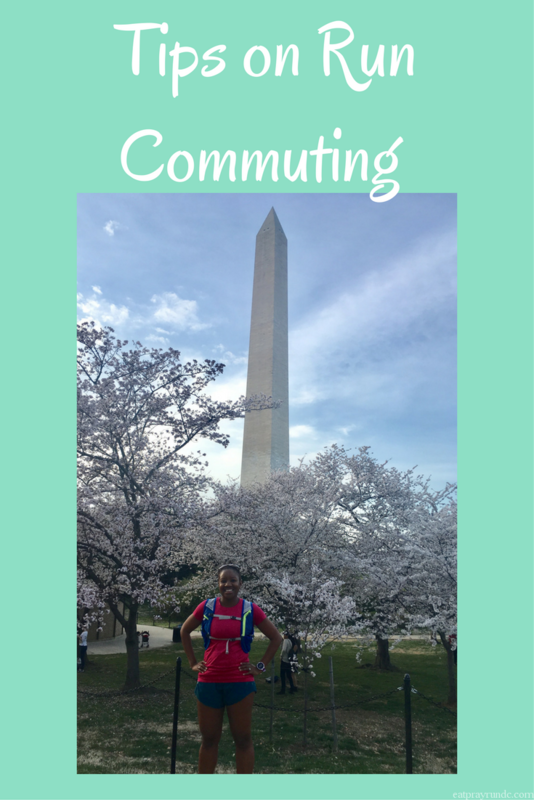 Do you run commute? What tips should be added to the list? I wish I could run commute but I can’t. I work too far away and it is on a major highway! Sound so like you have a good method going. Do you have to worry about time and leave your house earlier? Also, do you have to shower or freshen up once you get to work? I have a shower at work, so that’s pretty easy. And actually I can sleep later when I run TO work because I don’t have the commute time added to my morning routine – it’s commute + workout all together! I used to live close enough to run commute before moving to my house but never tried it – I wish I had because it’s definitely a nice way to get in an easy run! My current commute is a bit too sketchy, lol! No shower at work, not to mention I live 25 miles away. I’m in awe of people that can pull off a run commute. I would do it if I could! Yeah, running almost a marathon to work would not be awesome, lol! Great tips! I’m hoping to do ride my bike to work this summer when my schedule permits. Though I’m not comfortable riding near cars, there is a great trail from my house to my work location – about 10k! One AH-Ha moment from bike commuting in DC – think about small chunks. At first, I would break the year into “commutable season” vs “too cold” and would stop biking mid-November. THEN I realized that there are beautiful days regardless of season where commuting was a joy. So I’d check the weather and ride whenever I could. I could even do “half commute” – leave my bike at work overnight if weather didn’t cooperate, then ride home the next day. I used to love run commuting! Unfortunately now, when I go into the office, I have to bring my laptop and It a too heavy to run with. Plus, I don’t go in every day so I can’t easily leave things there and bring them the next day but at least I have the option of working from home most days! For security reasons I’m expected to bring my laptop home with me every night. That doesn’t make run commuting very conducive for me, but I so wish that I could make it possible!